B&T has launched its annual Women in Media Awards today, a program recognising exceptional women who have achieved professional success, while also celebrating their invaluable contribution to their industry. Entries in the 18 categories, which span the advertising and media industry, are open to women at any level of their business, from chief executive to new starters, and will be judged by a panel of top female executives. We will also be awarding Woman of the Year – this will be chosen by B&T as being the most influential out of the field of entrants; as well a People’s Choice and Lifetime Achievement Award winners. Entries for B&T‘s Women in Media Awards are now open. Enter here. You can also buy tickets here, or read more here. In honour of the 2019 WIM launch, B&T decided to interview some of the inspiring women that make up the team and hear their thoughts on why events like WIM are important, their most influential female figure and the best advice they’ve been given. First up, an important message from Misfits Media/B&T events director Viv Luo, and how the powerful and fearless women in her life shaped her into the woman she is today. “I’m surrounded by fearless women in my family. My late great grandmother was among the first of her generation to not have bound feet. My grandmother survived the war, went on to have an education and became a teacher herself. My mother lived through a famine, the forced labour camps of the cultural revolution, then went on to be a single mother for most of my childhood. “Now that I’m a mum of two young children myself, I’m deeply invested in the future that we’re creating for the next generation. I want my daughter to never worry about not being paid the same as a man for doing the same job, or only being able to reach her goals as far as the glass ceiling will allow. 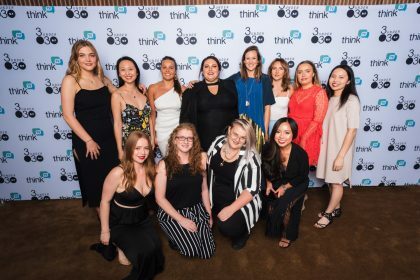 “B&T Women in Media Awards is our chance to reflect back on and celebrate the achievements of all the women in our industry and give them a boost to take the next step in their careers. This program is also my contribution to creating a more equal future and a more levelled playing field for those looking to enter the industry. Why do you think the Women in Media Awards are important? They ensure that women remain front and centre in an industry dominated by predominantly males at a c-level. They set the gold standard in excellence for an industry that is ever evolving and they showcase the abundance of talent we have in this country. Name the most influential woman in your life and why? Mum. She taught me how to say no which is one of the most powerful things a woman can learn in business. What barriers have you had to overcome in the workplace? The perception that women lead with emotional connections to the decision-making process. When you were little, what did you want to be when you grew up? Did you change your mind? Are you in that role now? I wanted to be in a role where I had the ability to affect change and to work in a creative field. Very much so in that role today. Having the confidence to ask questions every step of the way will always lead to more effective outcomes. Although I’m encouraged by progress in how women are portrayed in media and advertising, too often I notice that the news and media I am consuming still mainly centres around men. Unfortunately, due to the gender make-up of our political parties and the boards and senior executives of major businesses, news coverage and commentary from men far outweighs that of women. And when women do make the front pages, it often serves to perpetuate the same old stereotypes. That’s why I think B&T’s Women in Media Awards are important. This awards programme makes sure that women are making headlines for the right reasons. It recognises a huge number of incredibly successful female executives and rising stars across many different businesses and roles. For the next generation coming through, it’s inspiring to see women in leadership positions who have achieved so much in their careers. And it shows that they can do it too. My mum is absolutely the most influential woman in my life. She’s intelligent, determined, brave and dances to her own song. I like to think I follow her example. The main barrier I’ve had to overcome is a lack of confidence. Those that work with me now probably find that hard to believe. But six months into working for B&T, my first sales manager resigned and his replacement lasted just three months. I was waiting to find out who his replacement might be when our CEO Dave asked me if I would be interested in the role myself. My initial reaction was that this was a ludicrous suggestion. I’d only been working in media sales for two years. I turned down the job with a laugh. However, Dave didn’t take no for an answer. He told me he knew I was capable of the job and he and his business partner Dan arranged for me to have one-on-one external coaching to support me as I transitioned into the new role and learnt how to hire and manage my own team. In retrospect, I’d actually already been doing the role for three months so I have no idea what I was so afraid of! We can be our own worst enemies. Find that person who believes in you more than you believe in yourself and let them help propel you forward. All too often I see women taking a backseat to men, either because they are forced there or don’t feel like they can jump into the driver’s seat. I think the WIM Awards highlight the incredible things that can happen when women are in the driver’s seat whilst also inspiring other women to stand up and take the lead. Sometimes I feel my age is a bit barrier. I can’t tell you how many times I’ve heard things said like: “She’s good … but she’s so young” (even though I’m not that young!) I don’t think age should matter, but rather your experience and skills. However, I’ve learnt that if I know my sh*t, lead with conviction and stand my ground, there’s no limit to what I can achieve. When I was three, I wanted to be a sponge, like a thing you clean your kitchen sink with. Don’t even ask. Two years later when I learned how to read and write, I wanted to be an author and still do! I love working in journalism, however, and it’s pretty much a sister gig to an author. No matter what happens to you or around you, you have the power to control how you react and what happens next. A comfort zone is a great place, but nothing ever grows there. Cliché’ but…My mum – she’s always raised me to believe in myself and my abilities and lead by example by having a successful career and always being there for me no matter what – through it all. I wanted to be a veterinarian, yes! I couldn’t bare the thought of having to put animals down. And no, not even close. With a smidge of adult ADD, learning to concentrate has been a challenge. I wanted to be either a police officer or an actor. I’m neither of those, but it’s never too late. It’s important to celebrate the achievements of the fabulous women in our industry, their hard work, and how they influence and shape a better and equal future for other women. My mum, she’s the best! She’s so supportive, not scared of anything (maybe rats) and fights for what she believes is right. And she has the biggest heart. A singer. Could not handle the stage fright so I eventually gave up. We have a saying in Estonia, which I really love: “Kes ei riski, see šampust ei joo” (it translates into “the one who does not take risks, does not drink champagne”). I try to follow it as much as I can in life. YOLO is a pretty good one as well! I wanted to be a million things and still do. I loved writing, drawing, painting from no age. Making clothes, and jewellery out of things I found. I’m still keen to be builder someday. I never knew media and advertising was a career until I fell into it just over a year ago and it’s great! I get to work with people who create interesting things and that’s exciting for me. Every industry should celebrate women, media is just one of them. It’s a tie between my Mum and my sister. It’s thanks to them and knowing what they’ve experienced that I know I’m going to be alright. Learning to go for what I want, to work hard, to stay honest and humble, to be there for others, to listen, to speak up – it’s all thanks to them. Never say ‘I hate ___’ for no good reason. Don’t spread hate. The only time you’ll hear it from me is when I say, ‘I hate ginger in my food’. I do not discriminate when it comes to dessert…unless you have snuck some ginger in it. I think it’s incredibly important to keep funding time, effort and money into events like Women in Media because they not only acknowledge the incredibly hardworking women of our industry (that often go without recognition) but also hold us all to a standard where we are celebrating each other, instead of competing. Not only this, but the night feels full circle. We celebrate women for their achievements and through winning, doors are opened for them to climb further up past the proverbial glass ceiling – thus leading the way for the next generation, and the one after that. This is a hard question because I feel one of the biggest things to celebrate about women is our comradery and support systems. I wouldn’t be here today without my mums and the complex, exciting, inspiring women they surrounded themselves with when I was growing up. I grew up with an understanding that to be respected and liked, you had to tell the best story, or be the kindest, or funniest – instead of the best looking, most attractive, etc. The saying, it takes a village couldn’t be more accurate. The main barriers I’ve had to overcome in the workplace have undoubtedly been my own. My own confidence in my abilities and my rights as a female employee. My own understanding of what holds me back from speaking up in a meeting or asking for a salary increase. I, like most women, also have the stereotypical horror stories of working in a hospitality workplace and the rampant sexism which is apparently part and parcel with the experience – but I’d rather focus on things I can actually change, like myself. Through recognising these barriers, it gets easier to overcome them.